Some kids play with Barbie dolls, and some kids play with toy guns. (Some like both, and that's cool too!) But if your little gearhead is aching to play with action figures of fat, creepy-faced middle-aged men who like to complain about cars, then their day has finally arrived. 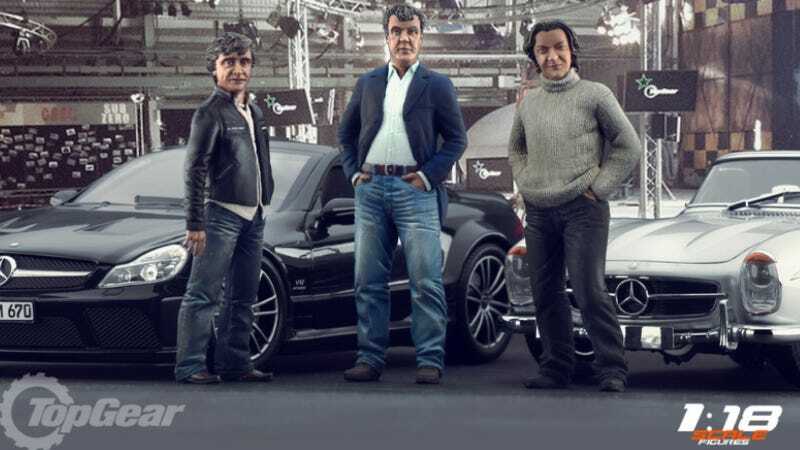 If you haven't adequately scared the crap out of your children lately, you can buy them these neat Top Gear action figures for the low, low price of $500. It has all three of their favorite hosts — James May, Jeremy Clarkson and Richard Hammond — wearing bizarre masks of terror that will be perfect for your child's future therapy sessions. The best part is that the cars in the photos are not included, which encourages you and your kid to start collecting die cast models together so the creepy old men have something they can stand next to. As far as we know, the Clarkson figure does not have a ripcord that makes it scream "POWERRRRRR" over and over again.